This tool is used to estimate the exact P-Value using Monte Carlo. Typically this would not be necessary unless the sample sizes were smaller (each sample N <= 5 for Kruskal-Wallis), but this gives continuity on the example. (i.e., more than the number of stars in the observable universe). So we will not attempt to compute the exact, but rather use Monte Carlo. 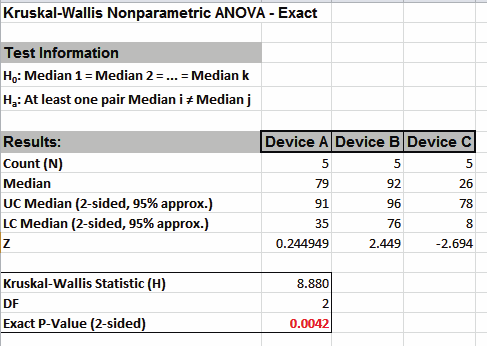 Click SigmaXL > Statistical Tools > Nonparametric Tests - Exact > Kruskal-Wallis - Exact. If necessary, check Use Entire Data Table, click Next. Ensure that Stacked Column Format is checked. 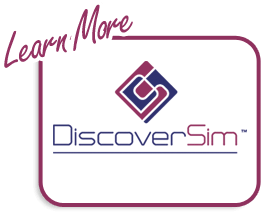 Select Overall Satisfaction, click Numeric Data Variable (Y) >>; select Customer Type, click Group Category (X) >>. Select Monte Carlo Exact with the Number of Replications = 1e6 and Confidence Level for P-Value = 99%. One million replications are used because the expected P-Value is very small as estimated from the “large sample” Kruskal-Wallis above. This will take up to a minute to run, so if you have a slow computer, use 1e5 replications instead of 1e6. Click on cell B16 to view the P-Value with more decimal place precision (or change the cell format to scientific notation). The Monte Carlo P-Value here is 0.000009 (9 e-6) with a 99% confidence interval of .000002 (2 e-6) to 0.000016 (1.6 e-5). This will be slightly different every time it is run (the Monte Carlo seed value is derived from the system clock). So we reject H0: at least one pairwise set of medians are not equal. 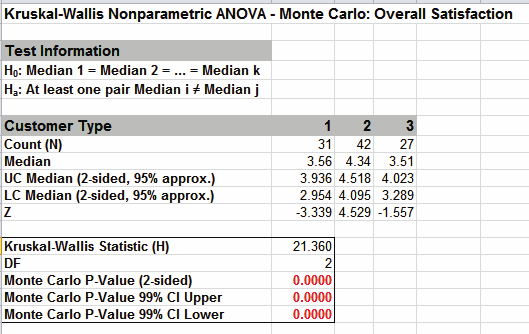 Note that the large sample (asymptotic) P-Value of 2.3 e-5 lies outside of the Monte Carlo exact confidence interval. Gibbons, J.D. and Chakraborti, S. (2010). Nonparametric Statistical Inference (5th Edition). New York: Chapman & Hall, (Example 10.2.1 data, page 347; Example 10.4.2 analysis, pp. 360 – 362). Select Snore Study Data tab. 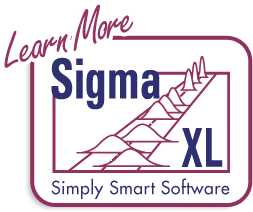 Click SigmaXL > Statistical Tools > Nonparametric Tests – Exact > Kruskal-Wallis - Exact. If necessary, check Use Entire Data Table, click Next. With the Exact P-Value = 0.0042 we reject H0, and conclude that there is a significant difference in median snore study scores. This exact P-Value matches that given in the reference textbook using SAS and StatXact. By way of comparison we will now rerun the analysis using the “large sample” or “asymptotic” Kruskal-Wallis test. Select Snore Study Data tab (or press F4 to activate last worksheet). Click SigmaXL > Statistical Tools > Nonparametric Tests > Kruskal-Wallis. If necessary, check Use Entire Data Table, click Next. With Unstacked Column Format checked, select Device A, Device B and Device C, click Numeric Data Variables (Y) >>. 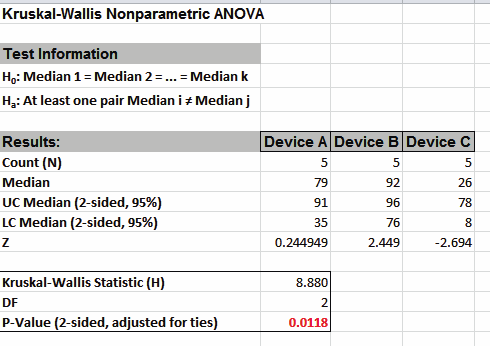 With the P-Value = .0118 we reject H0 (using alpha = .05), but note that if we were using alpha = 0.01, we would have incorrectly failed to reject the null hypothesis. This “large sample” P-Value matches that given in the reference textbook using Minitab.